My first experience with "the hardest working man in show biz" was in fifth or sixth grade, watching one of those cheesy low budget "Beach Party" movie rip-offs called "Ski Party" on TV. Starring beach movie regular Frankie Avalon and "Dobie Gillis" star Dwayne Hickman, I thought this movie was hilarious at the time, a real "find" that I had to tell all my friends about. This movie predated the "Bosom Buddies" concept of men dressing like women by at least a decade. And like many movies of its ilk, it featured cameo performances by rock, pop and soul stars of the time. "Ski Party" had Leslie Gore singing "Sunshine, Lollipops and Rainbows" on the college bus traveling to the ski chalet, and the Hondells performing "The Gasser" on a beach somewhere. However, the corniest cameo was by far James Brown and his Fabulous Flames, who play a heavily-dressed ski patrol crew who rescue one of the goofball characters, somebody recognizes them for who they are, and they suddenly break out in "I Got You (I Feel Good)," dropping their parkas and wearing the most preppie red and white wool sweaters you've ever seen in your life. I feel privileged and honored to present this classic scene. But that was about the only James Brown song I liked for a long time. "Mother Popcorn" became a hit, but I didn't get into it because it remained on pretty much one chord for the whole song. That was my complaint for all the James Brown stuff I heard -- too long on one chord. Fast forward to the early 80's. The new wave and New Romantic movements of music, all heavily influenced by and making tribute to American black soul, bring back a rush of all these classic R&B and Motown songs to the clubs again. I bought a 12" single by an English studio group who put together their own "Stars on 45" by slicing together various James Brown hits to a pumping 4/4 beat. I started hearing James Brown at parties, and then put them on my mix cassette tapes. When I went out dancing with my girlfriend at the time, and the DJ spun"I Got You," I not only had every word memorized, but the black man inside propelled me up in the air, spinning around with arms flailing and legs kicking. I finally started to get James Brown, a very delayed reaction for a white guy from Queens who got into R&B and soul at an early age. I hung out at the Sounds used record store on St. Marks Place one afternoon, and they were on a James Brown marathon over the stereo system. I caved and bought a James Brown greatest hits compilation on Polydor records, and then in later years, bought the whole Startime anthology. I finally understood Brown's power of the never-ending groove, funk and jazz, even if it was one chord for a few minutes. I realized I had to let loose a little more, not think about it and just let it take me. Sometimes the best songs are just the simplest. 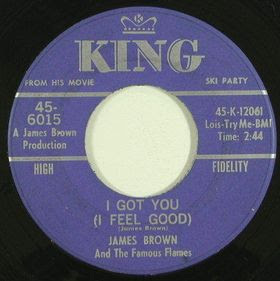 "I Got You" has the award-winning intro of a patented James Brown wild scream ("Wo-o-w-w-ww!"). You hear that shout, you know it's time to get going. It's about as close to a pop song you'll hear from Brown, under three minutes of uptempo blues, swinging saxophones, and those easy nursery rhyme lyrics. I feel good, I knew that I would, now. So good, so good, I got you. So nice, so nice, I got you. I know that I can't do no wrong. My love won't do you no harm. and I feel nice, like sugar and spice. I feel nice, like sugar and spice. In these simple lyrics, you get loads of shouts, screeches and held notes. The man is a ball of outrageous energy. And that ending, when the horns do their solo staccato, a tiny pause, a quick snare snap, Brown's explosive "Hey!" and the last chord -- it's just perfect. Watching the above "Ski Party" clip and the videos below is that this man could dance. Brown swished and swayed across the floor like somebody greased the bottom of his shoes, while snapping his head to the beat. He was so popular, that he broke through the most white bread TV shows of the era. Three very special videos below: the first two are black and white clips of Brown slipping up a storm on early 60's teen TV shows, and finally the man himself on the Ed Sullivan Show in 1966.